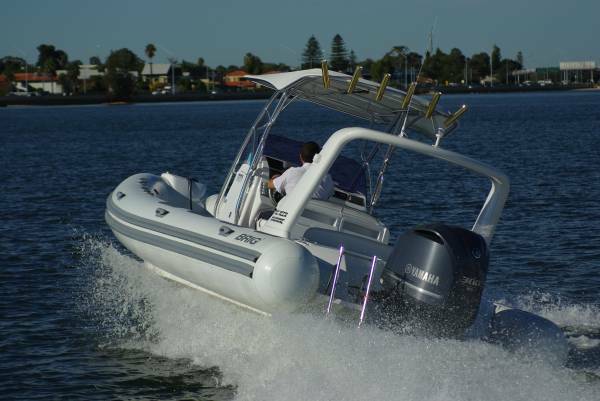 Large rigid inflatables (RIBs) generally cost a lot more than conventional boats of the same size. Even RIBs with vinyl tubes - that sound like they should be cheap - are expensive. Which makes the European Brig Eagle 780 something very special. With Hyperlon tubes, giving many times the life of vinyl, first class fittings and an excellent finish, it costs from $115,000. 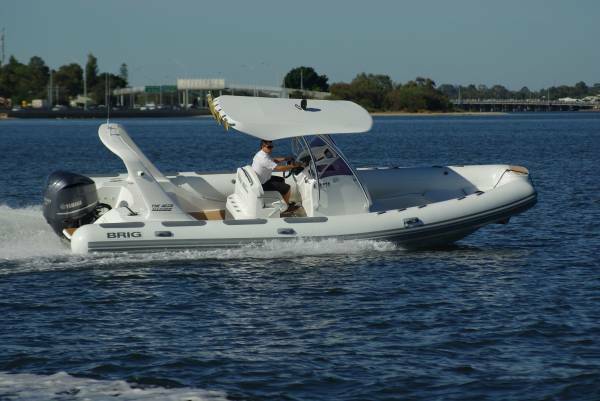 7.8m of RIB is a lot of boat, enough to have 16 as the recommended maximum number of people on board. There are official seats for ten, which is a comfortable number leaving moving-around room. For tasks needing the full capacity, perhaps ferrying passengers out to the big boat, the side tubes make pneumatic seats for the extras. 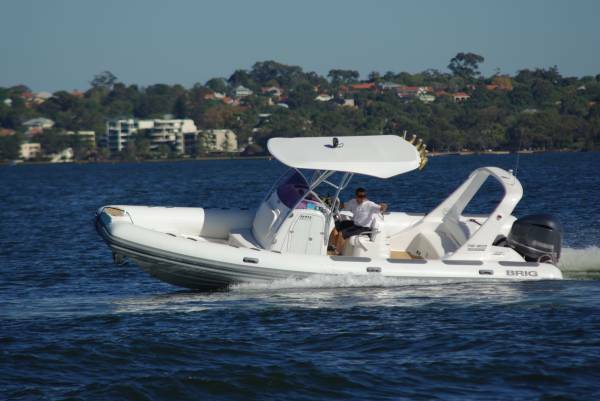 Sport-fishing tender for the mother ship is the obvious role for this style of boat, but it also gets buyers who want an express day cruiser or simply the collection of capabilities it has – chief of them for many being the super-soft ride and the performance to need it. Standard – also the maximum - power unit for the Eagle 780 is a 300hp Yamaha. 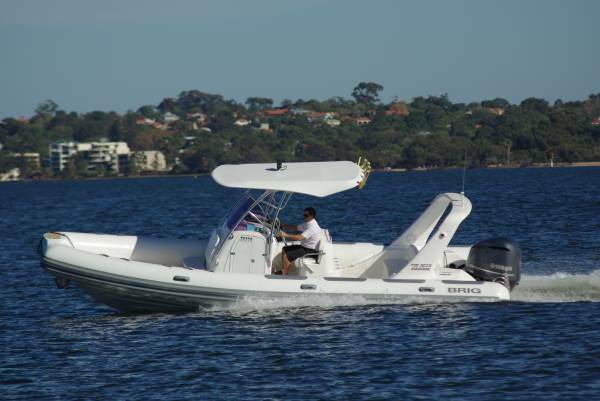 This is the large capacity, extremely lightweight V6, whose cubes plus a lot of sophisticated design give it great torque. This translates into phenomenal acceleration, right up there with a hot four-cylinder car. Top speed is just over 45 knots, the drag of the T-top holding it down a few knots. At a lightly stressed 4,000rpm cruising speed is 30; a wholly realistic cruising speed, which could actually be raised under most conditions. That T-top and its support are striking features. This Eagle has a frame for the T-top made to order by Pacific Blue Towers, one of the USA’s premier fabricators in anodised aluminium. The structure is a work of art as well as a thoroughly engineered item: two days of bending and meticulous welding went into the assembly of the dozens of pipe sections. The rim of the fabric it carries is stretched to fit into a track around its perimeter – no lacing or daggy bits. The rocket launchers across the top’s rear are anodised gold, a classy rather than gaudy touch. 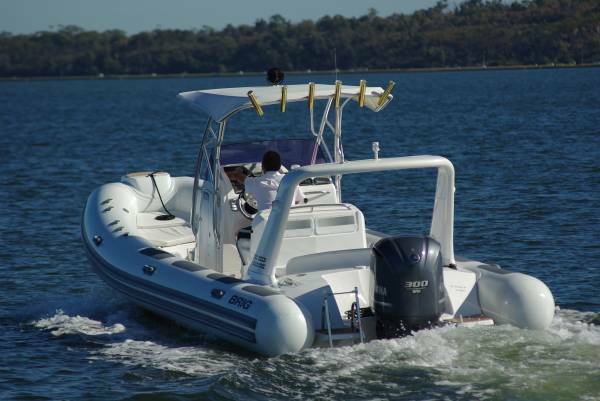 The buoyancy tubes limit internal beam, so the console has been located at the starboard side to maximise port side access fore and aft. This was necessary due to the console’s size; it is perhaps more accurate to call it a centre cabin since it houses an electric-flushing toilet. This is not one of those cramp-inducing chambers designed for contortionists: it is considerably more spacious than the average aircraft’s. 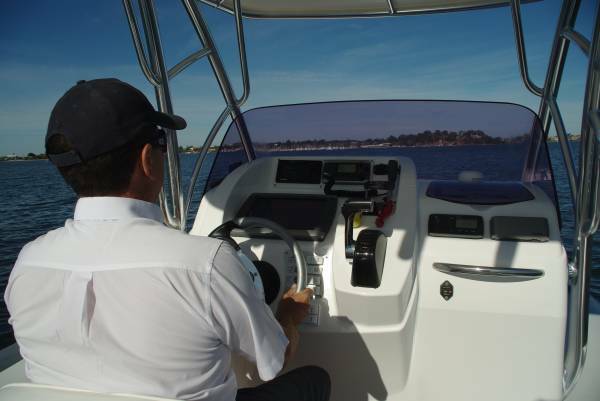 A double seat with lifting bolsters faces the console, and the view ahead is unusually good. The normal stiffening crossbar for the T-top structure, which depending on his height can foul the driver’s eye line, has been replaced by cunning triangulation higher up. Brig provides good quantities of storage space, largely under the abundant seating. 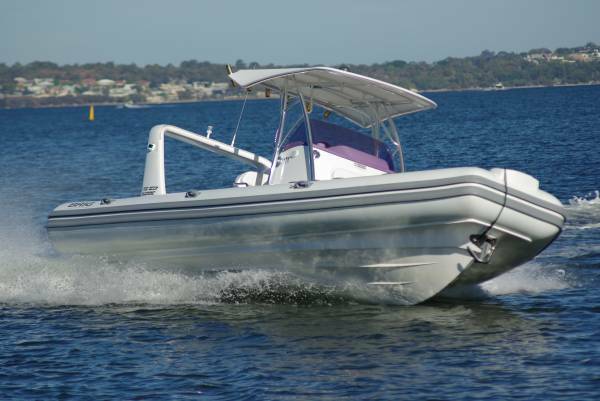 The task of opening the locker lids is handled by gas struts, and the other locker hardware is of a high standard too – a standard carried through to the rest of the metalwork on board. A good example of this is the anchoring arrangements – something usually poorly done on RIBs, due to the natural disaffection between inflated tubes and steel chain. The 780 cures this by removing any chance of conflict between the two by running the cable through the hull below the tube and directly to the power windlass, and stowing the anchor in a hawse pipe big ship fashion. The result is almost decorative with pipe, anchor and chain all in stainless steel. A sensible, though pricier, replacement of the usual carpet deck covering is granulated cork in a simulated planking pattern. Not as luxurious as genuine planking but more practical: spill red wine, beetroot juice or the like on it and it is not the environmental disaster it would be on the real thing. And though it may not be authentic it is extremely well done: it was tailor made in one piece and computer cut. It has two sockets in it giving a choice of positions for the table. 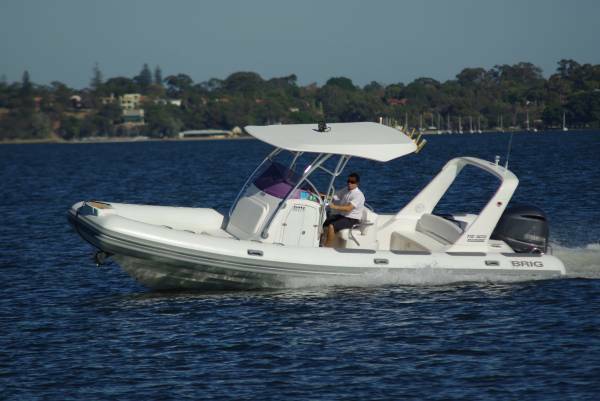 Despite its impressive size the Eagle 780 is not a heavy boat, partly thanks to the lightweight motor and more to a construction philosophy that emphasises technique and material quality rather than sheer quantity. On its trailer (one that will need a permit due to a beam well over 2.5m) it is under 2500kg even with fuel on board. Plenty of vehicles around that can handle this.